This morning on Five Live Investigates – arguably one of the most under-rated shows dedicated to investigative journalism around – I had a bit of an epiphany. The result of that epiphany is the infographic I’ve tried to create above (click on it to see a larger version). On today’s show, presenter Adrian Goldberg covered the issue of ambulance response times. Now the rules around ambulance response times are common knowledge in newsrooms: You have Category A calls, the most life-threatening, which should see a paramedic with you within 8 minutes (the target is that 75% of such calls should have a response within eight minutes). “At least once every shift we are waiting for more than 30 minutes,” said the paramedic, who did not want to be named. “And we’re talking about time-critical patients, not someone who has just cut a finger. This is what I’ve called the ‘expert knowledge’ in the diagram above. 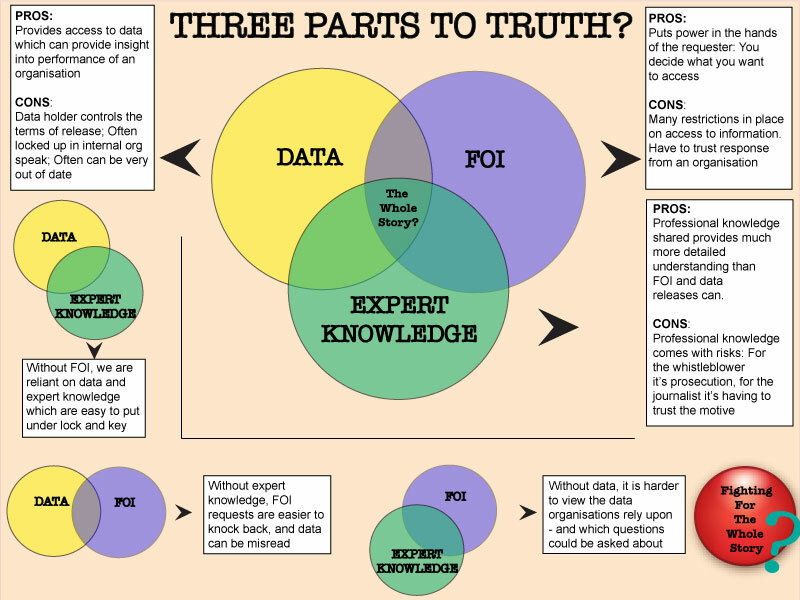 Expert knowledge can come in various forms: It can be the head of an organisation defending what the data says, or it can be a press office attempting to bamboozle and say the data is wrong. Or it could be a specialist reporter who knows what the technical terms mean and knows the right questions to ask – the sort of reporter who laughs when a hospital says it doesn’t have any cases of ‘bed blocking’ because that reporter knows they need to be asking about ‘delayed discharges. Or it could be the whistleblower, as Five Live Investigates demonstrated this morning. Armed with that ‘expert knowledge’, Freedom of Information becomes a very useful tool. Unlike open data, it puts the control over what data is released back towards the requester. Of course, there are numerous reasons why that information may not be released – but the assumption of having a right to know enshrined in law is one we should cherish, and one we should fight for. Figures released after a Freedom of Information request show that incidents where patients waited for more than 30 minutes after the first responder called for back-up increased from 1,241 in December 2011 to 2,884 last November. The biggest problems were in Essex. Not necessarily a different story to the one told by the government data – but certainly one with more information. Note that the Government data doesn’t tell you how many Category A calls are received. When the three parts come together, it’s a safe bet we have the Whole Story. Remove any one part, and that becomes less likely. Like Data stories which just report numbers without any expert knowledge applied. Or an FOI request which reveals information about one council but lacks any contextual overview data from other councils to compare. Or the expert knowledge which is hard to verify without either data or FOI. I’m not saying stories which rely on any one part alone aren’t important, relevant stories, but together they make for something very important. And that’s why this story on Five Live shows why we should always strive to knit all three together – and ensure we retain access to the Freedom of Information Act in its current form.